A mixture of cultures**SEE COOK'S NOTES** in the spectacular stir-fry meat and potatoes dish. Beef tenderloin makes a statement on the pride the Peruvians take in this, a most popular dish that comes straight out of the Incan Andes. 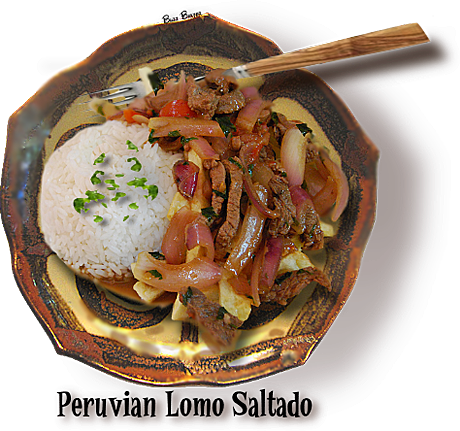 The Peruvians are so proud of this dish, that it is almost an insult to vary the ingredients. Try to stick as close to the recipe as possible, perchance one of your guests is from Peru. •	2 lbs. beef tenderloin. cut. Cut potatoes into ½ inch strips. Return strips to cold water. 2. Meanwhile chop all your ingredients for your beef stir-fry. pepper, cinnamon and cumin and 1 Tbs. of soy sauce. with pan juice , garlic and chile to a bowl. Reserve. 5. Add a little more oil to the pan or wok if necessary and stir fry onion, until barely soft, about 1 minute. set aside and repeat procedure with tomato. crisp and golden brown, turning once. and cook for ½ minute. Add 2 tablespoon of the chopped cilantro and the potato fries and toss gently. immediately, accompanied with white rice.